One of the most basic blocks to become a multi-millionaire is to make sure that you have a surplus of cash each and every month. Simple formula, right? Much easier said than done though! I know it’s something that we’ve struggled with from time-to-time. 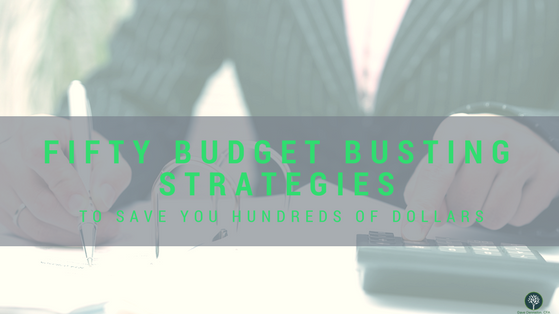 As such, here’s a list of 50 budget busting strategies to save you hundreds of dollars monthly. Buy your car in cash (preferably used)- NEVER lease or borrow. Just use the cash on hand- whether it is 2k or 5k or 20k. Shut off your home phone and get off the bundle! Cut the cord on your cable (and the five billion channels you never view). You already have Amazon prime, right? And Netflix? And Hulu? Like the big carriers? Sign Up for T-Mobile and get Netflix for free. Go for a hike, watch a parade, or have a picnic in the summer. Cheap entertainment! Check for rates on Airbnb before you book your next hotel. You may even get on a houseboat like I did! NEVER pay for car rental insurance or having them fill the tank. You lose money every time. Avoid Disneyland/world. Those places are amazing- but you’ll be down a couple thousand bucks for the privilege. Negotiate your contract, your home, your property tax bill, what you pay your accountant, and yes even your financial advisor (cringe)… pretty much anything and everything! So, there you are my friends- 50 easy ways to save money on your budget--- now for the hard part—save it and don’t spend it! What do you think I am missing? Is there something you are doing or using that could be helpful to others? E-mail me at [email protected] with your thoughts.